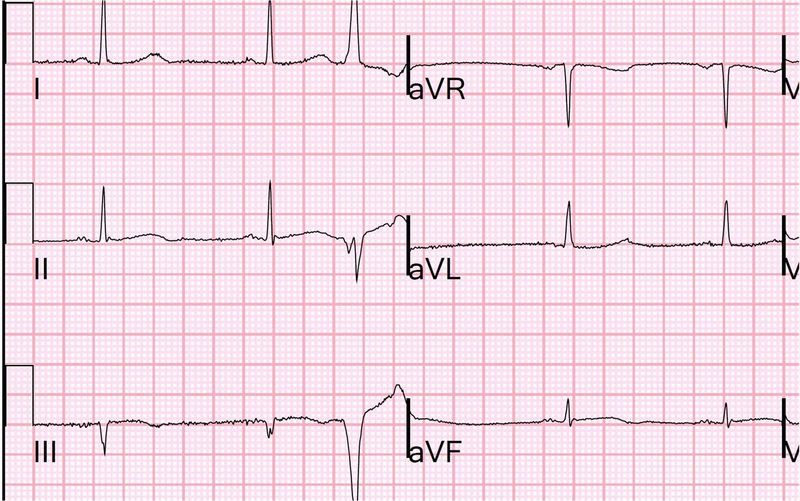 There is sinus bradycardia with a PVC, and an artifact on the 8th complex. There is a significant Q-wave in lead III, with very subtle ST elevation in leads III and aVF, and, importantly, some reciprocal ST depression in aVL. There is also high voltage suggestive of LVH, but no repolarization abnormalities that are typical of LVH. This is very suspicious for inferior MI of unknown age. It could be old MI with persistent ST elevation, or it could be subacute MI with new Q-wave, but is unlikely to be very acute (with a Q-wave and without large T-waves). If it is a subacute MI, there should be a positive troponin. The first troponin I returned at 0.74 ng/ml, diagnostic of acute MI. 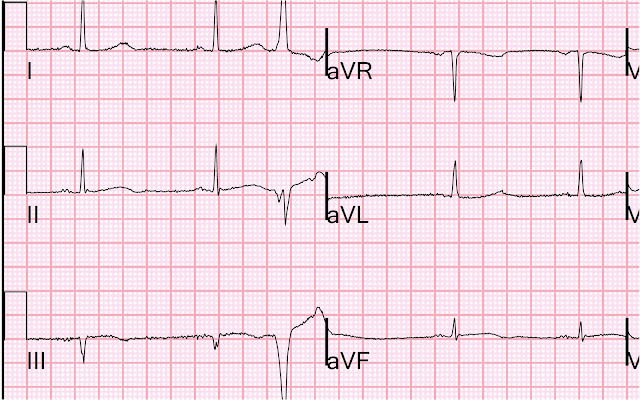 Is this STEMI or NonSTEMI? That is an arbitrary definition, based on millimeters of ST elevation. Every physician should know that biologicial systems do not follow millimeter rules, so many "NonSTEMIs" are due to coronary occlusion. The important thing is whether the patient has ongoing ischemia after almost 12 hours of chest pain, and as long as the ST segments are elevated or depressed, or the patient has chest pain, one must assume there is ongoing ischemia and do something about it. She did receive antithrombotic and antiplatelet therapy, and nitroglycerine, but her pain did not subside until she received hydromorphone. Then it was not until a second troponin returned at 4.40 ng/ml 4 hours later, that she was taken to the cath lab. Cath revealed a 100% occlusion of the mid- first obtuse marginal (OM-1). Troponin I peaked at 49 ng/ml. Echo showed an inferolateral wall motion abnormality and concentric hypertrophy. 1. Any ST depression in aVL is abnormal. We studied consecutive inferior STEMI patients and 100% (154 of 154) had some ST depression in aVL; among pericarditis controls, zero of 49 had any ST depression). What we don't no for certain is how many inferior early repol cases have some ST depression in aVL, but it is, in my experience, exceedingly rare, and this case does NOT qualify for early repolarization, which must have good R-wave amplitude in all of II, III, and aVF (here there is a Q-wave in III). On occasion ST depression in aVL may lead you stray, as in this recent post (which is an anomoly). Notice there is 1. Excellent R-wave amplitude, 2. No ST depression in aVL, 3. 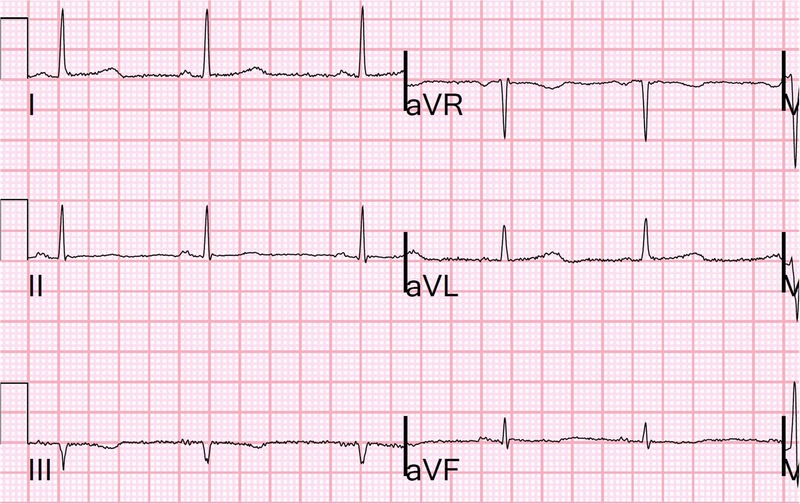 Proportional T-waves. There is also 4. a short computerized QTc (in this case very short at 354 ms). Notice there is also 5. normal atrial repolarization wave (PR depression); this is not a case of pericarditis! 2. "NonSTEMIs" may be large and due to complete persistent coronary occlusion that needs emergent reperfusion. Millimeters do not measure occlusion. Large MI may be very subtle on the ECG. This was not a small MI, with peak troponin I of 49.0 ng/mL (large MI). 3. Inferior MI does not always mean Acute MI. This patients initial ECG could represent old MI with persistent ST elevation, subacute MI, or old MI with superimposed acute MI. When the patient has such typical pain, and especially when you have a positive troponin, assume it is acute or subacute. With such a minimal troponin elevation, this was NOT subacute. As it turned out, the myocardium had been ischemic, with only minimal infarct, during those 12 hours, as evidenced by the only minimally elevated troponin. 4. Opiates will obscure the diagnosis of MI. Morphine has been associated with higher mortality in ACS and this is at least partly because the relief of pain is confused by physicians as relief of ischemia. There may even be other mechanisms. 5. If in doubt, get an immediate echocardiogram. In this case, it would have confirmed MI and allowed for earlier cath lab activation. 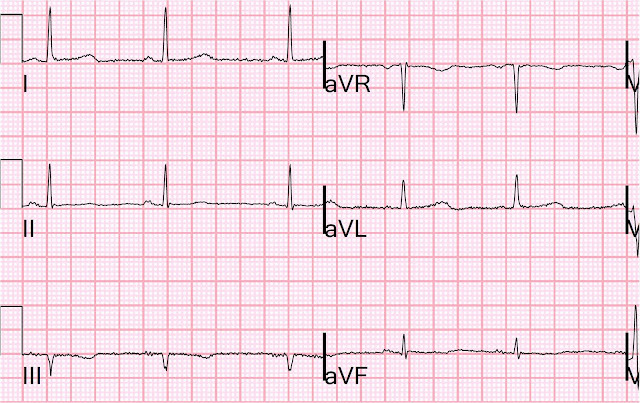 It may not differentiate old MI from acute MI, but absence of WMA would be helpful in finding a false positive. However, they can produce false negative results even in very large MI! 6. Positive troponins alone are not grounds for cath lab activation. There must also be ongoing ischemia as evidenced by either the ECG or ongoing pain, both of which were positive in this case. 1-with regards to the possibility of old MI with persistent elevation, how does reciprocal depression fit in with that? can you have persistent reciprocal ST depression? 2- In the initial ECG, the QT seems to be on the longer, rather than shorter side, and compared to the second ECG seems to be a bit longer, although subtle. Does that factor into the decision making in this case? Inferior LV aneurysm with STE in lead III always has reciprocal ST depression in aVL, so this does not help you. As for the QTc, I don't know how inferior MI affects it. Should study it some time. I'm glad you made note of the fact that the hydromorphone obscured the diagnosis here. It has never made sense to me how some folks observe the relief patients get from morphine and attribute it to a reduction in ischemia. It's as if administering it to an ACS patient somehow negates all it's narcotic effects and it becomes a pure vasodilator. Just because someone's broken arm feels better after a dose of fentanyl doesn't mean it's not still fractured, so why should we assume that someone pain free after morphine isn't still infarcting. Anyway, there's a lot of learning points from this case, thanks for sharing. To piggy back on Vince D, how you you suggest approaching pain management in ACS patients. Just nitro? What do you think about a shorter acting analgesic like Fentanyl? Hi Dr. Smith, I really enjoyed your talk at the AllNYC conference today. Thank you for the handout of goodies. Almost all the EKGs that you said were STEMIs... I'm sure I would have considered them normal or early repol. Yikes! I will have to look extra extra hard at EKGs. Thanks for shedding lights on some myths (concavity, etc) and for the illuminating talk! Thanks. I enjoyed New York and the Conference! Great case of infero-lateral MI ,sometimes right sided EKG help see the extension to posterior aspect but they usually present with dropping of BP I don't see here , and also I have a comment about the pain killer ((opiates) even it has lots of hazards in clinical practice ,but patients need a strong pain killer to alleviate the symptoms and to risk the complications. GREAT points you raise on this case Steve! — including the need to put all pieces in the equation together in forming your clinical conclusion. That is, the initial ECG was not at all diagnostic — but, in context of the history of severe chest pain the entire previous night — with ongoing chest pain at the time of this tracing — with positivity (albeit slight) in the initial troponin value — the onus is on us to determine what is “old” vs “subacute” with indication for prompt cath (that in retrospect should have been done before the 2nd troponin came back). And although subtle — the 2nd ECG you show IS diagnostic (!) — because we see reversal of inferior and reciprocal changes in aVL. I would add Learning Points #7 ( = put all pieces together when forming your clinical impression) — and #8 (acute inferior MI sometimes manifest the most SUBTLE of changes — so be aware of this, and don’t necessarily expect obvious ECG abnormalities). The subtle ECG changes in the 1st ECG should raise your suspicion (given the history) — and serial change in the 2nd ECG (given the history) is absolutely diagnostic. Namibia!!! Wow. Must be a wonderful place. 2.5 mm in men under age 40.